Here’s what I normally take my lunch to work in (if I can be arsed): leftovers in foil thrown into a ratty old M&S plastic bag. It’s so glamorous. Just so glam, glam, glam. In fact, it’s so incredibly off-putting and unappetising that I hardly ever bother. Would I be more inclined if I had something nice with which to bring my lunchables into work? Yes, I think I might, actually. And here’s the thing: when I do take food with me in the AM, I avoid that whole spending €20 on bugger all malarkey. So I dug out a few lunch bags, boxes and eat-y accessories I thought we might all like to see brightening up our desks right about 12.45pm of an afternoon. That there above? Misleading I know but it’s not actually paper. Modeled on the classic American lunch sack, The Paper Bag, £9.75 from thekitchengiftco.com, is made from tyvek. It’s reusable, tear-proof and leak-resistant, keeps cool items chilled and closes magnetically. 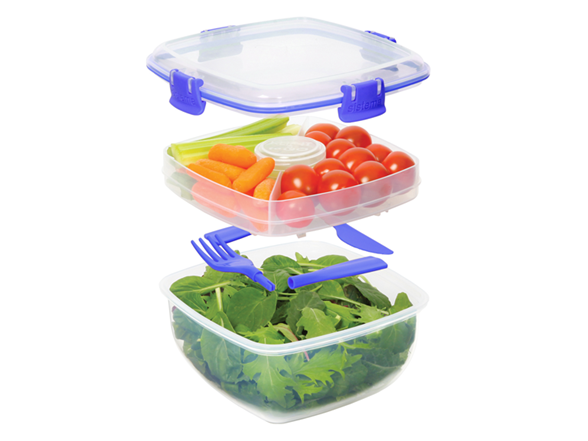 This Box Appetit, €20 at Designist, is clever doofer that’s for you if you’re a fan of salads: it’s got two compartments and a removable sealed extra tub for sauces or dressings. You can stick the base bowl in the microwave and the lid seals on super-tight so it’s leak-proof. Oh, and you get a forky-knife with it as well. Two for sandwich fans: The Yay Lunch box (top), £6, from www.zincandco.com, is retro-fabulous. Two plastic pieces are held together with a stripey elastic band, while the lime green sandwich box (bottom), £12.99 from lunchboxworld.co.uk (no, really, there is such a website) comes in a ton of other colours too. It’s got space for a sanger, an apple and a carton of juice. Sweet. What if you need something to chow down with? Easy: This cutlery set is not only Lego-tastic but it’s also stackable so you can keep the pieces all together easily – and no one can nick it. £15 from maidenshop.com. Lastly, sometimes work’d drive you to drink, eh? That’s where this lips hip flask comes in. Surely no one would ever consider it contained anything other than cordial? £8.95 from thekitchengiftco.com. What do you take your foody bits to work in then, eh? One Pink Topshop Dress; Three Ways to Accessorise It. Easy Peasy! I rushed over here when I saw you tweet about this, as a regular lunch bringer. I have a multitude of tiny lunchboxes on account of having a brace of tiny humans. Some sturdy sensible airtight ones, some frivolous paperchase numbers. But I also have a green version of the elastic band one I bought about 5 years ago in Amsterdam. Yep. I went to Amsterdam, and I bought myself a lunchbox. Love the paper bag one thats cool. But I don’t think I could put soup in it. Soup no, sangers yes. I constantly buy boring boxes and then leave them at work, never to be seen again. SIGHSIES. Like the designist one a lot, but at 20, if it got nicked I would thqueam and thqueam. Oh I need the lipstick hip flask in my life and it would be deadly gift for my buddy. Like idea of salad one though. Without the terrifying carrots, exactly like that.